Visualization can be a powerful tool for problem-solving. It’s used formally in many disciplines — from mathematics to architecture, and physics to landscaping. Indeed, visualization is one of the primary ways we study problems, design and plan, and arrive at solutions. For those of us more linear, wordy types, illustrating or drawing a problem may not come naturally. But learning and practicing problem visualization can help us develop powerful skills. In future posts, we’ll be exploring visualization as a problem-solving tool on a more sophisticated level, but let’s start with basic charts. While my problem visualization skills could use some development, I note that I use charts and graphs regularly, as well as arranging my words spatially to enhance my understanding of a problem and make plans. Consider the simple to-do list. 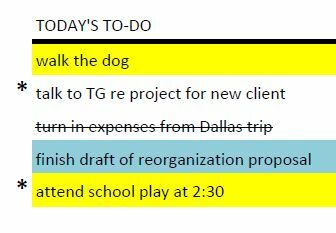 We tend to use words to make our to-do lists, but we may also add symbols and color to add additional information. Further, most of us don’t write the word DONE at the end of each task after it’s completed, but draw a line through the words describing the task – a simple illustration that helps us quickly focus. Do you have visualizations of problems — or know of others that you’d like to share? If so, email me at thepassionateproblemsolver@yahoo.com, and I would be glad to post them. I am building a library of sample visualizations, and with your permission, would love to include your work. This entry was posted in tools, visualization and tagged problem-solving, visualization.